I am often talking about how well we prepare our students. I’ve shared anecdotes about their success in high school, about the colleges they attend and the merit scholarships they receive. So, to answer your question, indeed, your children are prepared! 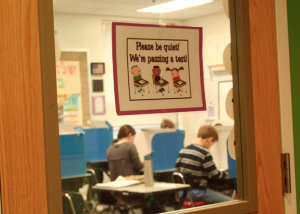 They are exceeding not only suburban-public school norms, but in most areas, independent school norms as well. This week, a consultant in town from Prizmah said, “Cheryl, it’s not typical for students in a Jewish day school to exceed independent school norms.” Her words convinced me to change my long-standing policy of keeping the scores private and to give you a window into the excellence of Mirowitz. Mirowitz is in aqua. The numbers on top are the median percentile score. Suburban public school norms are in blue. Independent school norms are in yellow. What makes the scores so extraordinary is that we do not teach to the test. 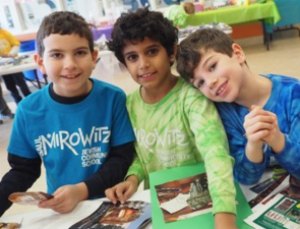 At Mirowitz, we teach children to be excited, curious, authentic learners. We provide an environment where it is safe to take intellectual risks, to explore and to grow, and on top of that, we teach Hebrew, Judaic studies and spend time each day in prayer. So, yes, we are proud that the learning that happens at Mirowitz translates into high test scores. 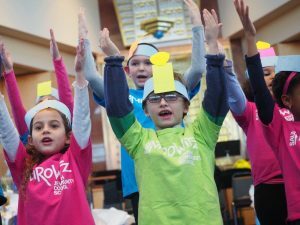 But even more, we are proud that guests to Mirowitz so often comment about how exceptional our students are…in their behavior, their deep thinking, their focus and their joyful spirit. 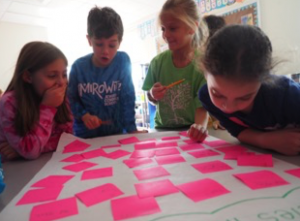 We know that a primary reason is this: authentic learning simply feels good! Our parent surveys recently revealed that our parents satisfaction is also high. 95 percent of parents are pleased with the way this school year is going, and 97 percent are pleased with their teachers. These numbers look even better when you know that the independent school benchmarks are closer to 83 percent. At Mirowitz, we know that our work is never done. We thoroughly enjoy seeking excellence, and engage in self-reflection and continuous improvement as a habit. We have read and take seriously every parent comment and constructive suggestion. They will guide us as we provide for our students an education and a childhood beyond compare. After all, children deserve nothing less.